More babies riddled with bullets in Parkland, Florida simply because they were learning. Here's what we do know about the 18th school shooting of 2018... ignoramuses blame everything on mental illness when only 3-5 percent of violent crimes are committed by the mentally ill. The principal question is, why are ARs and AKs inexpensive and available? Why can a high school senior buy a WEAPON OF WAR right now? There are 300 million guns in the States. 42 percent of Americans own guns. 30 percent of that group owns more than five guns. The top reason cited for owning a gun was protection (67 percent), followed by hunting (38 percent). There are fewer than 300 justifiable (self-defense) killings each year. Only 5 percent of Americans hunt. How does that result in over 135 children and teenagers being shot every week? Why do hunters use guns? Because they are unwilling or unfit to pick a fair fight with their prey. Try slaughtering a buck with bare hands instead of dressing up in cammies, hiding behind a wide pine, and pulling the trigger from 50 meters deep. And to those who think they need an assault weapon to defend themselves against an aloof supermarket checkout dude or a librarian with a chip on her shoulder, perhaps consider swapping a zip code for an off-the-grid cabin. There are 75,000 non-fatal injuries and 35,000 fatal injuries by firearms each year. 12,000 homicides and accidental deaths. 22,000 suicides. Guns in our living rooms. Guns in our bedrooms. Guns in our boardrooms. Guns in our cars. Guns in our schools. There were 203,000 background check requests filed last Black Friday alone. One day. Americans possess nearly double the number of guns per capita of any other place on the planet. The six countries that follow us in gun ownership are Serbia, Yemen, Cyprus, Saudi Arabia, Iraq, and Uruguay. Our favorite companions. How many school murders involve knives or bare hands? How many schools have been blown up? If a domestic terrorist is strapped with a bomb in the school cafeteria, a teacher with a gun will not do much good. U.S. - 101 guns per 100 residents. 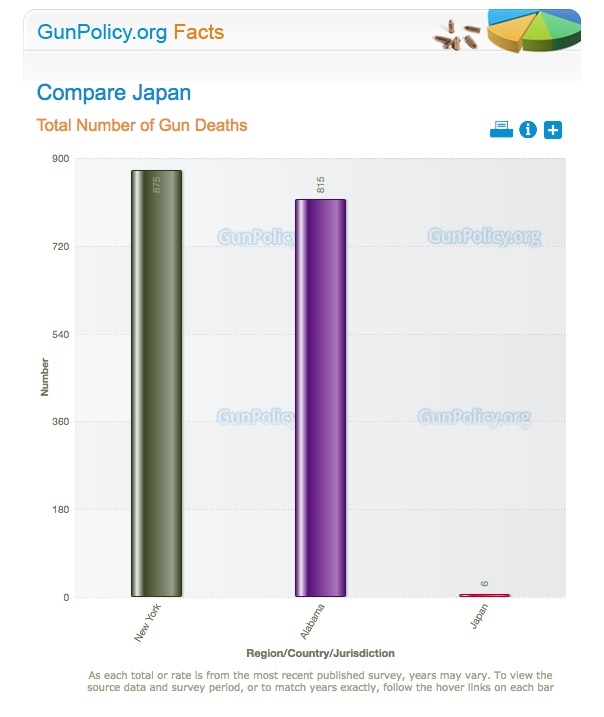 Japan and that "shithole" nation of Haiti - .6 guns per 100 people. Per Business Insider, "If Japanese people want to own a gun, they must attend an all-day class, pass a written test, and achieve at least 95% accuracy during a shooting-range test. Then they have to pass a mental-health evaluation, which takes place at a hospital, and pass a background check, in which the government digs into their criminal record and interviews friends and family. We have other more pressing matters to consider, such as tax breaks for the rich and buckling the justice department. As long as gun victims are in our thoughts and prayers, we'll heal, regardless of our insatiable desire to eat ourselves alive. About those "thoughts and prayers" - feckless political types and bible-bound souls believe such carnage can be assuaged via telepathy? No god would allow a bullet to rip through a child's brain while (s)he reads Tom Sawyer or fingerpaints. What makes America unique in its obsession over guns? Come Tuesday, November 6, 2018 1.) Americans can call upon every single fellow American to withhold his/her vote from any politician who gets a penny from the NRA, 2.) Americans can call upon every single fellow American to require that Wayne LaPierre and his regime in Fairfax, Virginia must personally wipe up bone, muscle, and blood following every shooting, 3.) Americans can call upon all pro-life fellow Americans to explain how they are enraged by a woman's choice but peachy with the slaughter of innocents, and 4.) Americans can call upon every fellow American to reread the 2nd Amendment, because it does not mention anything about deploying weapons of war for the expressed murder of children.